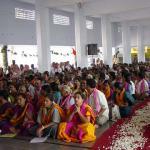 His Holiness Sri Ganapathi Sachichidananda Swamiji arrived in Gandigunta Ashrama on the morning of 4th January 2003. Gandigunta is a village, where agriculture is the main occupation. This village is situated on the road from Vijayawada to Machilipatnam at a distance of 20 kilometers from Vijayawada. This tiny village has the distinction of having one of the 16 Datta Nakshatra Temple. The Datta incarnation here is Datta Digambara.HH Sri Swamiji first came to Gandigunta on 15th February 1988 upon the invitation of Sri N. Subba Rao.HH Sri Swamiji performed the Kumbhabhishekam of the Datta Temple on 17th January 1991. Upon arrival, Sri Swamiji was warmly received by the members of the Gandigunta Ashrama. Sri Vadde Shobanadrishwara Rao, Agriculture Minister in Andhra Pradesh Government was present. 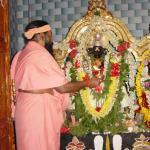 Sri Swamiji went to Datta Temple and offered Arati to the Dattatreya and Anagha Devi idols. Sri Swamiji then inaugurated the new Kitchen complex and prayer hall. Sri Chakra Puja was performed and Sri Swamiji then honored the major donors of this prayer hall and the kitchen. A Telugu book titled “Krishnavataara Rahasyamulu” (Secrets of Krishna incarnation) was released by Sri Swamiji. Its author was honored. In the evening Pada Pujas were performed by devotees. Sri Swamiji addressed press persons. There was Satsang in the evening. A cake was cut in honor of Sri Swamiji’s 60th year festivities. 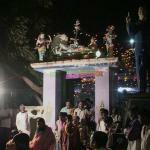 In the night, Sri Swamiji visited a Rama temple in Harijanavaada and gave away gifts to young boys and girls who had performed well in the recently conducted Vishnu Sahasranama competition. Sri Swamiji spoke and said that Harijans should not feel as outcasts and should come into the fold and learn all prayers and Pujas and help themselves. Sri Swamiji visited yet another Rama Temple (The oldest one in the village). 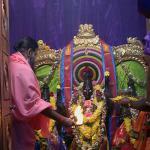 On 5th January (Sunday), Sri Swamiji performed Sri Chakra Puja and then performed the Kumbhabhishekam to the Datta Digambara temple as it was the 12th year of its inception. Sri Swamiji spoke from the top of the temple tower and gave a call to the public to follow the path of truth, simplicity and righteousness. In the evening, Sri Swamiji sang Bhajans and gave a discourse. Omkara is Pranava, which represents Aakasha Tattva. It also means formless and Ganesha. Ganesha is Pranava Svarupi. He is the ether principle himself. He has all the eight accomplishments. One who can control the (his) breathing is called Vighna Raaja. One who can ensure there is no problem with his or her breathing. It is a practice to worship Ganapati before commencing any work. We pray so that no obstacle comes in our works. Even a thief prays Ganapati. Does he get blessed? The thief may even offer a share of his loot to the Hundi. Does it work? No. Never. Never to such bad works which are Adharmic. Which is the greatest disease? Heart attack? Leprosy? No. According to Lord Krishna’s words, it is greed. Greed is the greatest disease. A greedy person also has jealousy. Because greed comes from jealousy. A greedy person contaminates any good atmosphere. They sport a depressed look and never smile. Their very presence in a happy atmosphere is poisonous. They continuously self abuse. They feel that they are the greatest person, that they are the most truthful. They have a feeling that the priests are looters and that Swamis are great fakes. They act as if Satya Harishchandra is their father and Satyavan Savitri their aunt. How can this be? Once you have a body, you are bound to have problems. You eat and gain weight. The problems come with bad eating habits. No one is responsible for this. You alone. No one can suffer for you. They can suffer because of your suffering. In the Ganapati Bhajan it is said he rules the Gana groups. Here Gana also mean nervous system. Girija is the goddess of compassion. So, Ganapati is the son of that compassionate Girija Devi. We go to eighteen Devi temples which are called as Shakti Peethas.We have many self made concepts like this flower is good for this God and so on. But when it comes to Swamiji, you feel that he does not need any flowers. Many of our intense devotion often is public nuisance. We go and break coconuts in temple in a place of our choice and cause nauseating sour smell. Poor priests get scolding from the temple office bearers. We talk loudly in the temple and we often carry crying babies and cause such troubles to others. When it comes to taking part in temple projects, you are the last. Devotees find ingenious excuses not to support a project. You break a coconut in temple to feel that you are breaking your ego. When you break your ego, you get the white and tasty coconut meat (Truth) and the sweet water is Jnana Ganga. Once you enjoy this Jnana Ganga, you will not want anything else. But our monkey mind always tries to see what benefits you get from your acts. You think that a particular temple is good or bad by checking how many desires of yours gets fulfilled. This is the same for Swamiji also. Many are part timers. They come to me when ever they want and stop coming when they feel they don’t want to come. The Goddess Durga removes this confusion. She Blesses all. To perform Guru Seva, you don’t need recommendation or influence. You can get it only by humility. One has to pass all classes from the basic. Only true devotion helps you. You should never look for recognition from others or Swamiji. Stop it. Stop looking for recognition in your life. You are not the creator of this world to be recognized and commended. That is why you should touch Guru’s feet praying that your ego gets crashed. The prayer of Narasimha just sang says – “Punish me with your sharp scolding. Slice my ego with those sharp and strong scolding. I remember a childhood story. I was in school. I was doing okay in science and maths. I was poor in English. Don’t take heart that you can do bad in English because your Guru was so. My head master was a good man. He came to my class and asked me to stand on the bench. He asked me to turn and he spanked me one. I was amazed. My next boy had only half my marks. But he went unpunished. This was Sarvajanika High School in Mysore. The name of the head master was Srinivasa Ayyangaar. He made me to stand on the bench the whole day. After school, I walked to his house which was about 11 kilometres away. I slowly opened the gate and went through their garden and knocked the door. The door opened and my master stood there .. looming large above me. He lifted me from the ground and hugged me. He asked his wife to get me milk and some bananas. I refused to eat and asked explanation for his action in the morning. He said “ Satya, This beating will make you get the maximum marks possible in the next test. Whereas the next boy is a good for nothing fellow. I want you to be the best.” This made me realize his goodness and fell at his feet. I remember him today. A good man. My Guru and teacher. May his soul be happy. 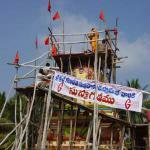 Today was the 12th year Kumbhabhishekam of the Datta Digambara Datta temple here (Gandigunta). Let me sing a Datta Bhajan. Sri Swamiji sings “Idigidigo Datta Ganga”. Sri Swamiji sings “Digambara Digambara”. Sri Swamiji concluded the Bhajans with Kaayena Vaacha. On 6th January (Monday), Sri Swamiji left Gandigunta at 8 AM and came to Kuru Maddali village and visited a Hanuman Temple. Sri Swamiji then traveled to Gudivada and visited the Ashrama site where a Guru Nilayam has been almost ready. 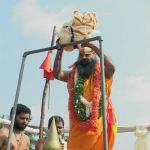 Sri Swamiji established Guru Padukas there and Blessed the Gudivada devotees.